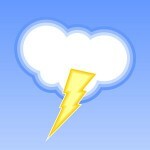 There’s a chance of a thunderstorm Wednesday night, says the latest, local National Weather Service forecast. A storm is most likely between 11 a.m. and noon and then again 5 to 11 p.m. Some chance of rain will persist into Friday.